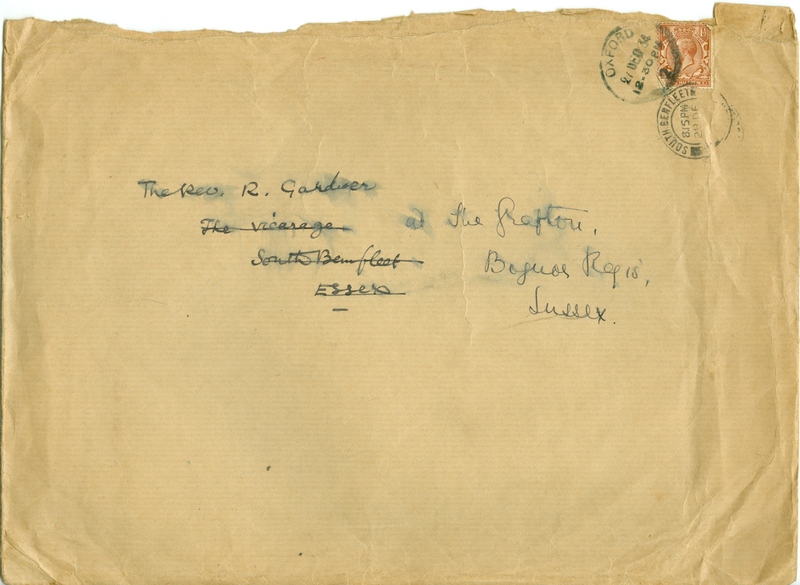 The material on this page is part of “The Matson Collection” which was given to the Archive by Betty Matson. Amongst the items passed to the Benfleet Community Archive was an envelope containing a letter from Sir Charles Nicholson to Rev. 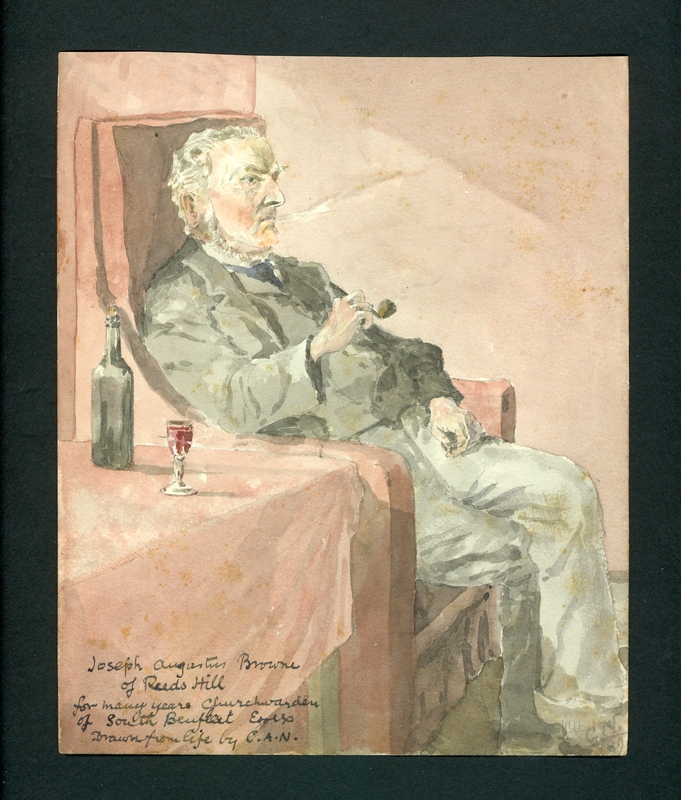 Ralph Gardner and the sketch of John Augustus Browne of Reeds Hill Farm, all of which are shown below. 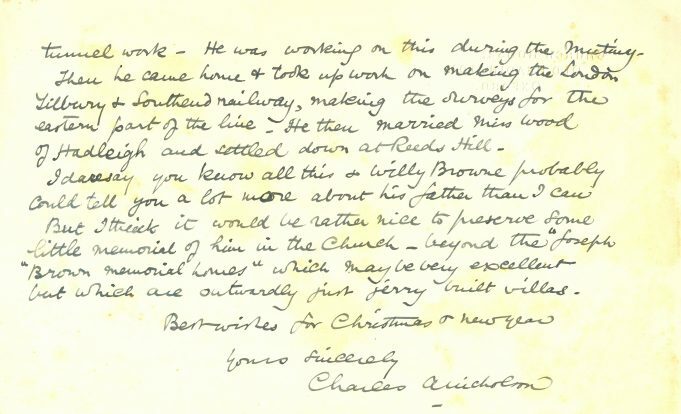 Below is a transcription of the letter written by Sir Charles Nicholson. Church House, where the letter was written, still exists and is a Grade II listed building. I turned up the enclosed sketch of my old friend J.A. 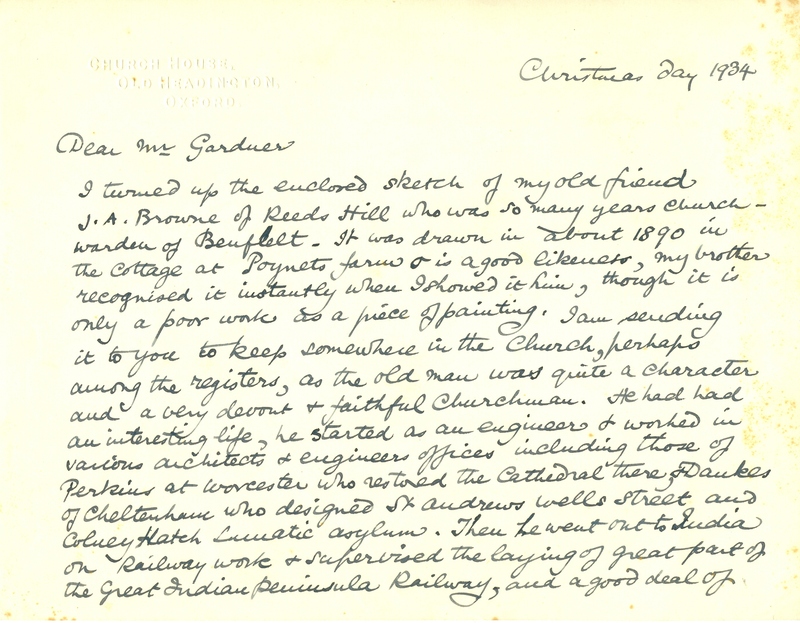 Browne of Reeds Hill who was so many years church-warden of Benfleet. It was drawn in about 1890 in the cottage at Poynets farm & is a good likeness, my brother recognised it instantly when I showed it him, though it is only a poor work as a piece of painting. 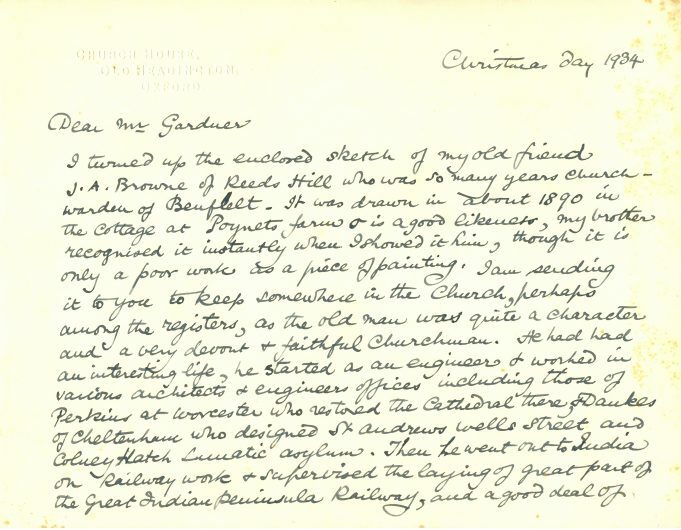 I am sending it to you to keep somewhere in the church, perhaps among the registers, as the old man was quite a character and a very devout & faithful Churchman. He had had an interesting life, he started as an engineer & worked in various architects and engineers offices including those of Perkins at Worcester who restored the Cathedral there, & Daukes of Cheltenham who designed St Andrews Wells Street and Colney Hatch Lunatic Asylum. Then he went out to India on Railway work & supervised the laying of great part of the Great Indian Peninsular Railway, and a good deal of tunnel work – He was working on this during the meeting. Then he came home & took up work on making the London Tilbury & Southend railway, making the surveys for the eastern part of the line. He then married Miss Wood of Hadleigh and settled down at Reeds Hill. I daresay you know all this and Willy Browne probably could tell you a lot more about his father than I can. But I think it would be rather nice to preserve some little memorial of him in the Church – beyond the “Joseph Brown memorial homes” which may be very excellent but which are outwardly just jerry built villas.